P.J. Roofing, Inc has been skillfully providing reliable roof repair in The Villages, FL since 2003. When it comes to a first-rate roof repair in The Villages, our experienced roofers do the job right, maintaining our commitment to high quality and customer service standards. We at P.J. Roofing, Inc have the expertise and dependability that you are looking for. 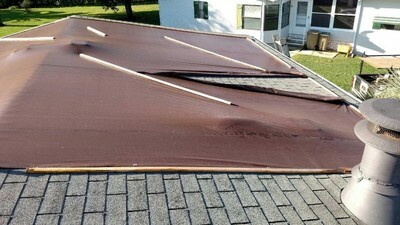 We offer the most professional and affordable residential and commercial roofing repair in The Villages, FL. P.J. Roofing, Inc can successfully fix a roof in The Villages, on virtually any type of roof. We perform The Villages flat roof repair, tile roof repair, shingle roof repair and metal roof repair for The Villages residents and business owners. When repairing a roof in The Villages, P.J. Roofing, Inc has an unbeaten track record. Fixing roof problems for our customers is our specialty. Let our experienced roofers in The Villages bring your roof back to life! Repairing roofs in The Villages is what we do best! Don’t hesitate to call us! P.J. Roofing, Inc roofers are the leaders in roofing repairs for any building, office or home. Whether it’s repairing a flat roof or fixing a metal roof in The Villages, we are your “go to” roofing company in The Villages. Since 2003, P.J. Roofing, Inc has been repairing roofs in The Villages. We have built a reputation being dependable and affordable for 16 years.. You can trust that P.J. Roofing, Inc’s roofers in The Villages are as friendly as they are professional at fixing your roof. Contact P.J. Roofing, Inc about your roof repair in The Villages, Florida. Our The Villages roofing crew will be happy to provide you with a competitive roofing repair quote and stand by the outstanding roofing service that we deliver.